For general purpose axial tensile, compression, and cyclic testing. Designed to also allow easy gauge length conversion. 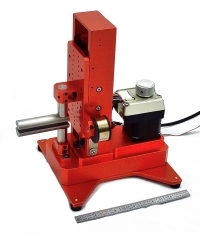 For axial tensile, compression, and cyclic testing small size specimens. For testing plastics, rubber, elastomers and other high elongation materials. For general purpose axial tensile, compression, and cyclic testing with furnaces or induction heating systems. A general purpose Clip-On Gage designed for fracture mechanics tests such as ASTM E1820, E399, and ISO 12135. For general displacement measurement and measuring deformation in three and four point bend tests. For general purpose measurement of transverse / diametral strain. Commonly used with model EAG for Possion's Ratio. For r-Value testing of sheet metal. For general purpose where an averaged axial measurement is required. For simultaneous measurement of averaged axial strain and lateral (transverse) strain in one unit. For load testing of bolts and similar yield / proof testing. Stand alone signal conditioners for extensometers. For calibrating extensometers to ASTM E83 & ISO 9513. For automated calibration of extensometers to ASTM E83 & ISO 9513. 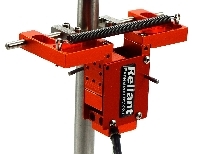 Reliant's model CERHV - very high resolution extensometer calibrator is a precise instrument designed for ease of use and long-lasting durability. Designed to meet the calibration requirements for ASTM E83 for 0.250" gauge length and greater extensometers as well as ISO 9513 Class 0,5 over the full measuring range of the calibrator, it features 10 nanometer resolution over a 50 mm (2.000") measuring range. Unlike competing units, our model CERHV is compact, has a low center of gravity, and its hand-wheel is conveniently and ergonomically located at table top or desk level. This innovative design has a high resolution digital encoder located near the axis of the central lead screw and its movable table is held in a stiff, compact frame by a crossed-roller rail system. It also has an easy to use, USB powered, stand-alone display. The display's units and resolution can be easily changed with a push of a button and it can be powered by a USB/AC adapter or any computer USB port. The calibrator allows for easy and accurate extensometer attachment. 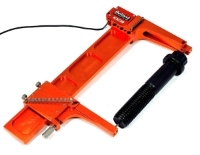 Long gauge length extensometers can be easily attached without the need for additional extensions to the calibrator's frame. The upper mounting post adapter is designed to allow easy axial alignment while the lower mount allows easy radial / concentric alignment. Adapters are available for flat or round specimens as well as for COD gauges and transverse extensometers. Model CERHV was designed from the ground up to allow easy conversion to a fully automated calibration system. Its manual hand wheel can be replaced with an optional stepper motor with a built-in drive and controller and pre-wired limit switches for safe, motorized operation. The calibrator can be commanded to move and its position read through one RS232 connection. Sample programs using VBA in Microsoft Excel are provided to allow you to easily create your own automated process. Full 50 mm (2.000") measuring range and 10 nanometer (0.394 micro-inch) resolution. Stand alone digital display with tactile switches for tare, units, sign, and resolution. Adapters available for nearly any extensometer. Each model CERHV is calibrated with a laser interferometer by an A2LA accredited calibration lab. Optional motorized version for automated calibration. Measuring Range: 50 mm (2.000"). 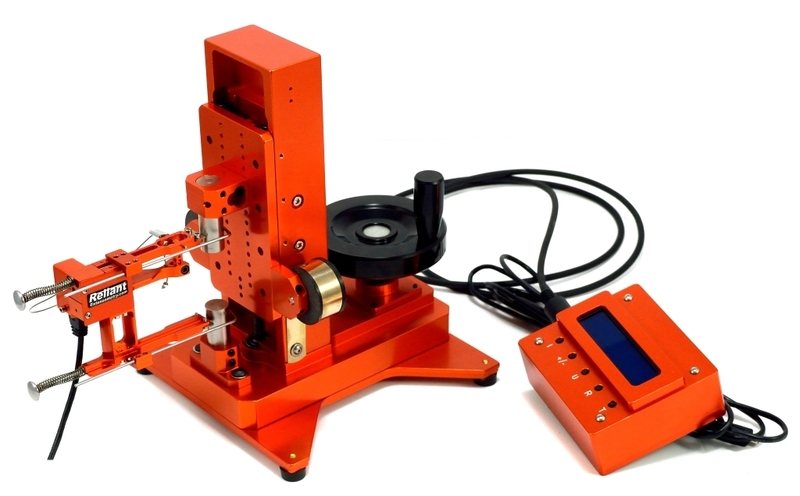 Accuracy: ±0.19 µm (±7.5 µm) over any 0.12 mm (0.00475") range. Resolution: 10 nm (0.4 µm). If you have any questions, please call or click request button below. Designed to meet the calibration requirements for ASTM E83 for 0.250" gauge length and greater extensometers as well as ISO 9513 Class 0,5 over the full measuring range of the calibrator, it features 10 nanometer resolution over a 50 mm (2.000") measuring range. Our model CERHV - very high resolution extensometer calibrator is designed for ease of use and long-lasting durability. Model CERHV is available in any configuration listed above. Other configurations are available; please contact Reliant with your requirements. If you have any questions or would like a quote, please contact us HERE. If your extensometer is in need of service or repair, please fill out an RMA form HERE.